Just as the love of VHS horror will never die, it seems neither will the efforts of indie horror directors to replicate that feeling in their movies. In my efforts to forever find movies that actually do it right, I indulged in two films with plots dependent on the very decades they are trying to recapture – the 80s and the 90s. The premise and the trailer for this one had me expecting a wickedly fun joyride of VHS nostalgia. Man, was I disappointed. This film just goes nowhere. It opens in 1992, with a family opening a video store. Yay! Flash to the present. The store owner has been mysteriously missing for quite some time, so his two sons come to close up shop. In his office, they find one of those old interactive VHS board games. This is where you imagine the brothers will play the game and become immersed in a fun, fantastical horror romp for the remainder of the film. Well, forget that. This film drags on and on and on. I just couldn’t latch onto the plot. The brothers kind of research the game. One brother has nightmares – the film’s desperate attempt to deliver some horror and (good) gore to keep us engaged. A couple of horror situations arise in their real life, but I don’t really understand what connection they have to the game. 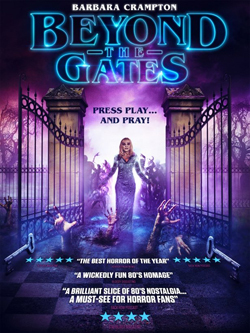 Finally, with like 20 minutes left in the movie, they dive into the game, which is hosted by horror icon Barbara Crampton (Re-Animator, From Beyond, We Are Still Here, You’re Next). 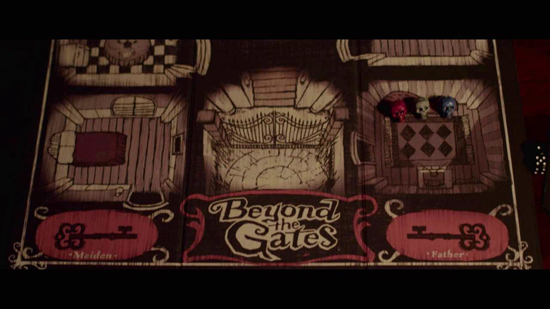 In the “dimension” beyond the gates, retro neon lights and fog machines abound, plus there’s some minor possession and encounters with a few demons. Considering how well put together Getting Schooled is, I was kind of shocked to discover it comes from the director of the painfully trashy film The Haunted Trailer starring Ron Jeremy (who has a cameo here as a school janitor). It’s April 20, 1983, which happens to be the date of my 14th birthday. Ah…the days when I believed I had a future ahead of me. The opening scene is perhaps the highlight of this film, with a totally 80s girl dancing to faux, totally 80s synthpop in a school library before having a grisly run-in with a boombox. The plot of Getting Schooled is simple. It’s The Breakfast Club vs. a crazed killer. Five kids – the bad boy, the jock, the popular girl, the geek girl, the plain (aka: main) girl – are stuck in detention. But they have a bigger problem; the teacher monitoring them all day is an ex-military man in a wheelchair who has picked my 14th birthday to snap and go on a killing spree. Getting Schooled has its charms, particularly the attention to 80s details and references: lace gloves, leg warmers, “Mr. Roboto,” MTV, New Wave, etc. The performances are strong, there’s some playful humor, and the mock 80s soundtrack is dead on. Even the kills are fun and deliver some good practical effects gore. The down side is that the film just isn’t very exciting. The kids lock themselves in the classroom for most of the film to go through their Breakfast Club soul searching, while the teacher gets in a few random kills on the outside. There are sporadic confrontations with the teacher that generally offer good cheap thrills, but overall, the film doesn’t deliver any sense of urgency, fear, or suspense. It feels like it just goes through the motions as it makes its way from one kill scene to the next. Even so, it’s definitely the winner of this nostalgic double feature for me. This entry was posted in Living in the 80s - forever, Movie Times & Television Schedules - Staying Entertained, Scared Silly - Horror Comedy, The Evil of the Thriller - Everything Horror and tagged 1980s, 80s, Beyond The Gates, demons, Getting Schooled, horror comedy, possession, slashers, supernatural. Bookmark the permalink.